As rescue workers reverently combed through the rubble to provide closure to families, the nation grieved with them. We wept together as stories emerged of loss and sacrifice. And we listened with dread to the crescendo of rattling sabers. all day; drought refuses forecast. We live by a tide-out lake. like raised footprints of ancients. for the tallest pines and old white birch. gasoline; we must brush our teeth. that we do not understand. We must go to war. “Dry September” was published earlier in the Beloit Poetry Journal (Spring 2004), and in the Poets Against the War Collection. 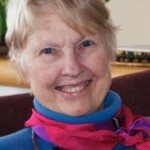 Based in Vermont, Elizabeth Conrad Vanbuskirk is a writer, educator, and frequent traveler of Peru and the Bolivian Andean areas. She gives talks and presentations about Inca history and art. Her book of fiction, “Behind the Stones of Machu Picchu: Stories and Folktales of Inca Life” illustrated by the Peruvian (Inca) folk artist, Angel Callañaupa, will be released later this year. Visit her website, Descendants of the Incas, here. This entry was posted in Daily PAW Post contributor and tagged Daily PAW Post, Dry September, Elizabeth Conrad Vanbuskirk, Poets Against the War, Sam Hamill, Vanbuskirk. Bookmark the permalink. darkening white clouds cotton to the blue. everywhere, in such a time, is hearth. the countless pixels of the human face. .